NX provides a complete set of numerical control (NC) programming capabilities in a single CAM system as well as an integrated set of manufacturing software applications. These powerful applications facilitate part modeling, tool design and inspection programming – all based on the proven, future-proof architecture of NX. NX allows the use of a common 3D model from part design to production. Advanced model editing, tool and fixture design, part and inspection programming are all associative, enabling fast, easy changes. NX’s powerful single CAM system includes a complete set of numerical control (NC) programming capabilities and an integrated set of manufacturing software applications. Drawing on NX’s proven, future-proof architecture, its powerful applications facilitate part modeling, tool design and inspection programming. 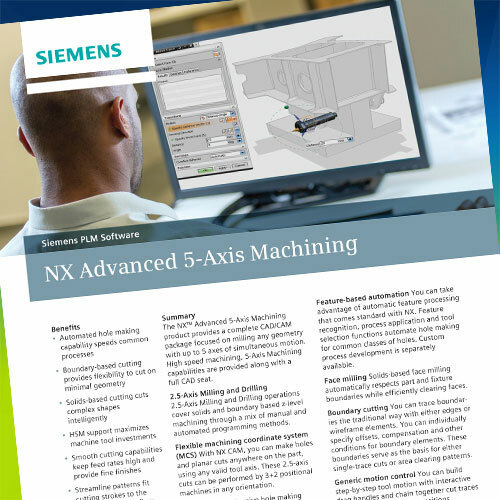 Utilizing a common 3D model from part design to production, NX makes advanced model editing, tool and fixture design plus part and inspection programming associative, thus enabling fast, easy changes. NX applications develop smooth-flowing manufacturing plans as a result of the ability of Teamcenter’s data and process management tools to intelligently connect individual pieces of information. This capability not only helps eliminate the need for multiple data bases, but it also makes it possible to re-use proven methods, manage tooling and connect the work package directly to the shop floor. The variability of scope it provides makes NX a favorite for manufacturing engineering in a wide range of industries worldwide, from the smallest shops to the largest corporations. NX’s solutions run the gamut from individual applications, such as CAM, to complete part manufacturing solutions that include connections to the shop floor systems and equipment. NX CAM provides a wide range of functionality, from simple NC programming to high-speed cutting and multi-axis machining. Such advanced programming capabilities allow one system to address many tasks. Productivity increases through the use of application-specific programming, such as the volume-based milling used for faster programming of prismatic parts. 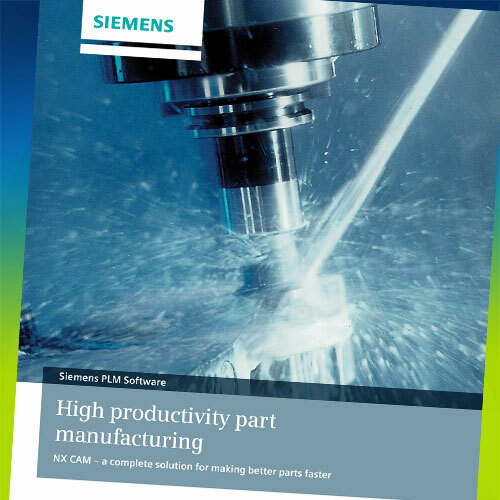 Feature-based machining can reduce programming time as much as 90 percent. Many typical programming processes can be streamlines through the use of wizards and templates. NX CAM features a tightly integrated post-processing system. Eliminate the need for separate simulation packages by using the integrated G-code-driven simulation. Productivity is streamlined through the user’s ability to work on the system graphically. For example, by selecting and moving the 3D model of the tool to create a tool path you can drive the system quickly and intuitively. The latest CAD technology in NX allows for rapid preparation of any part model for NC programming. - Rajiv Kapoor, Managing Director Rasandik, Engineering Industries India Ltd. Working directly with the part model, NX Mold Design checks designs and evaluates design alternatives with its integrated mold flow simulation. The entire process of designing the parting line and surfaces, core and cavity, and mold base becomes automated. NX Progressive Die Design automates the design process through its expert die-making capabilities. NX Stamping Die Design includes advanced capabilities to execute formability analysis, die planning, die face design and die structure design. NX Electrode Design automates the design of electrodes by integrating numerous industry best practices into a step-by-step approach. NX’s Fixture design capabilities include fully associative component design, assembly positioning and mating, kinematic simulation and performance validation. NX streamlines the entire inspection program development process by using coordinate measuring machines (CMM) Inspection Programming. It automatically generates programs by drawing product and manufacturing information (PMI) from the model (including GD&T and 3D annotation). It generates post-processed output, including the DMIS standard and machine-specific formats. Integrated inspection analysis catalogs measured data for comparison and study. Shop Floor Connect (SFC) for Teamcenter is an add-on for Teamcenter. SFC for Teamcenter allows access to and viewing of work package data on any browser-enabled device connected to the network. Users can review a wide range of manufacturing information, such as shop documentation, tool lists, setup sheets, pictures and drawings. SFC will also deliver CNC program files from Teamcenter directly into machine controllers with no local data storage. Unlike a traditional direct numerical control (DNC) system, this connection to the secure Teamcenter database avoids data duplication and manages revisions, thus ensuring the correct manufacturing data is used on the shop floor. NX CAM also optimizes output for Sinumerik controllers. This allows you to maximize machine tool performance once you select a range of special Sinumerik functions or cycle commands with the correct parameters. NX CAM’s included PostBuilder application includes advanced templates for developing comprehensive postprocessors for Sinumerik controllers. In some cases, by working with the machine tool builders, designers have been able to develop advanced post processors and simulation kits. 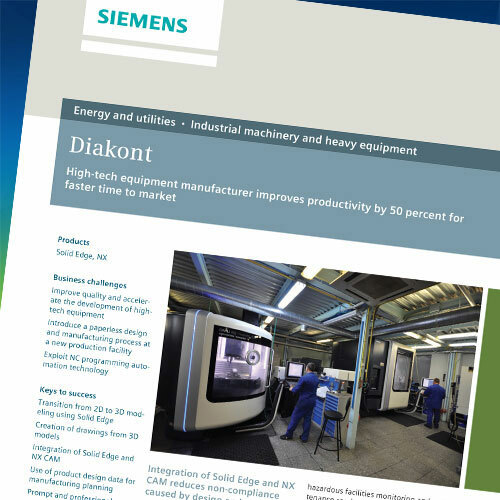 Due to the direct access to PLM information on the shop floor, our machines’ idle times are significantly reduced. Is Your HSM Investment Paying You Dividends?